While sailing through some rather adventurous seas, I received a message on my radio. 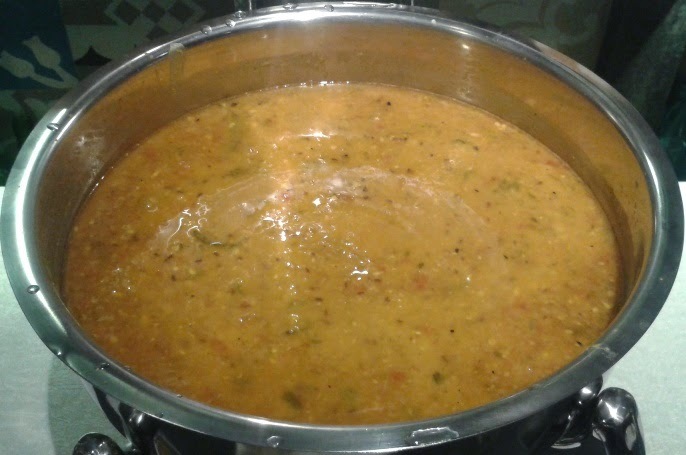 It provided me a map of a food paradise called Andheri Lokhandwala and with it was an invitation to an isle of pure vegetarian food. Intrigued, I turned the helm and set my course for Andheri Lohandwala. Let me be very clear, I am a carnivore. I eat Fish, Turkey, Mutton and Chicken. I don't usually do grassy stuff. When I got an invitation to a buffet tasting session in a pure vegetarian restaurant called Vedge, I was in two worlds about attending it. It is located quite far away thus requires a lot on conveyance and time simply to reach here. The city of Mumbai still lacks direct public transport connections between the east and west sides. I either have to take a taxi or switch three buses to make it here. Not wanting to miss an opportunity to meet fellow bloggers and reviewers, I decided to make the trek. Since the bus route would have taken ninety minutes, I decided to use an Auto Rickshaw which is the suburban version of Mumbai's taxis. The name Vedge also intrigued me as it was obviously a clever portmanteau of vegetarian and edge. 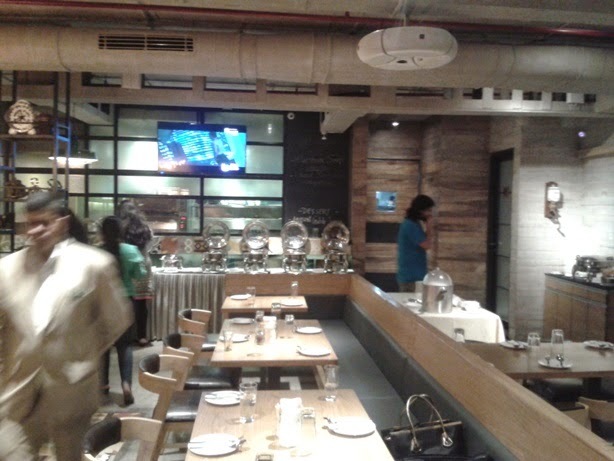 Passing through a road lined up with some of Mumbai's finest restaurants (temptations temptations), I arrived at Fun republic in Andheri West. Fun republic is a Multiplex but also houses a few restaurants. 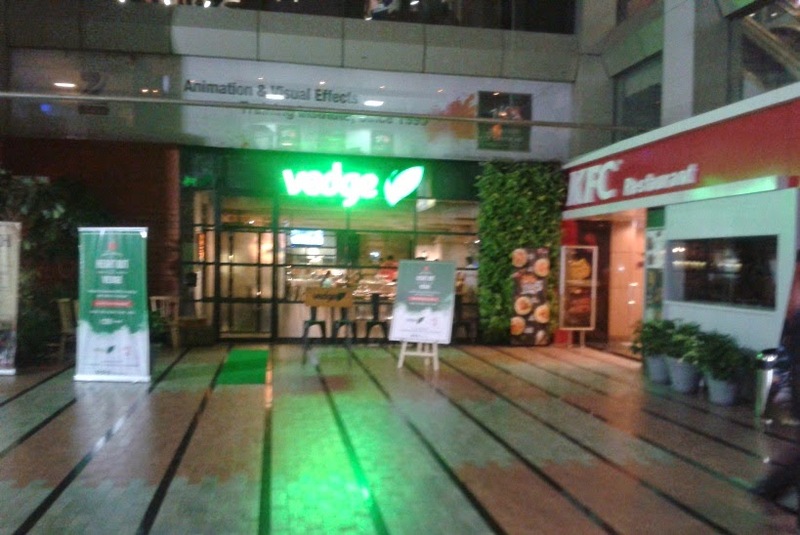 Facing giants such as McDonalds and Irish Pub, Vedge was the brand new place in Fun republic. The Captain and his landin' party walked down the gangplank and stared at the new isle. Surrounded by other flashy isles, the Captain said out aloud. "Aye lads, the grub better be good here." A witty crew mate then quipped. "But my Captain, Free food is almost always good." The Captain smiled. "That be true lad, but we shall see !" I met the event organizers Chandni and Purvi, who were working hard to make the evening a success. Since it wasn't dinner time yet, the place was still empty and allowed me to savor in the ambiance. For me, the feel of the place is always an important factor. A good decor always lightens up the mood and sends your imagination on a high. 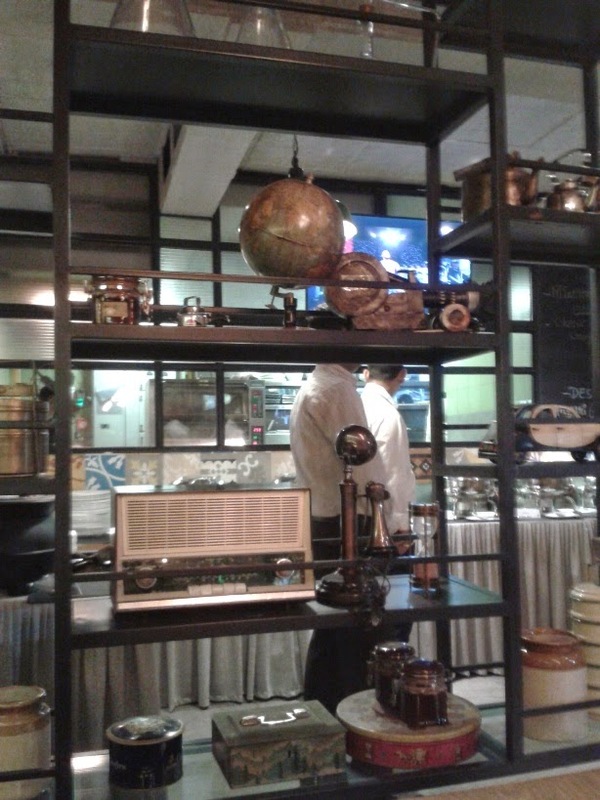 The ambiance of this place was a bit of a collage - Part modern, part street dhaba and part colonial (1900s). I would say the part colonial and the part dhaba style worked for me. The lighting in the section where our group sat was lovely. It generated a feeling of a roadside Dhaba located on a lesser used road. It was a shame that I could not capture the scene properly. I would have needed a very high resolution camera to capture the visuals in the way I saw it. My crappy phone camera had to do for now. We were greeted by the young owner of the establishment who was only 22. Well, he certainly is on the right path. If he does well, he could have a chain of places in the next five years. He had hired a professional team of chefs who look well groomed. These weren't your run of the mill chefs found in Udupi restaurants all over Mumbai. Before the buffet started we could order a drink as a part of the preview. I requested a Kiwi Margarita. After we were done marveling at each others drinks, I looked at my drink to find a way to drink it. I think that it was a bit too icebergy for me at the start. I had to wait for the slush mountain to become a glacier. Not a big issue but certainly could certainly be improved. It should have been be a glacier when served. Finally it was time to dine. 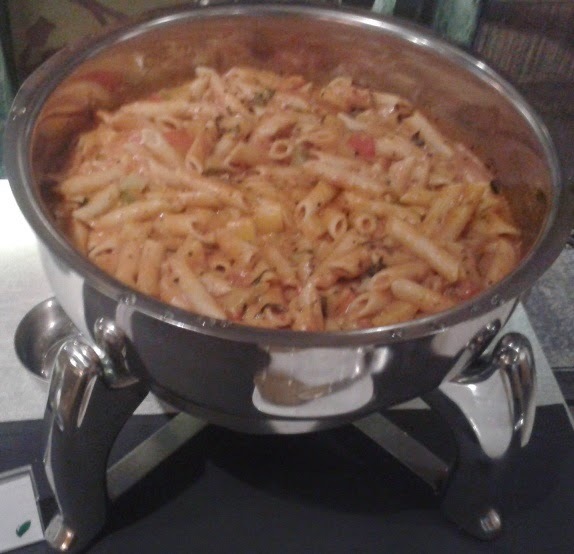 The platter was a nice mix of Italian, Indian and Chinese. Maybe a hint of Mexican as well. The platter changes everyday but I will write on what I experienced. "My ravenous appetite calls out to me lads. Lets dine, for tomorrow be a long day at the sea." After taking my plate, I went back to my table which had the friendlier of the two groups of the invitees - A group of experienced food bloggers, our hosts, Twitteratis and me. We had a lively conversation on the hits and misses of the food. The food was decent. Not too special I'd say but definitely a good start for a new restaurant. 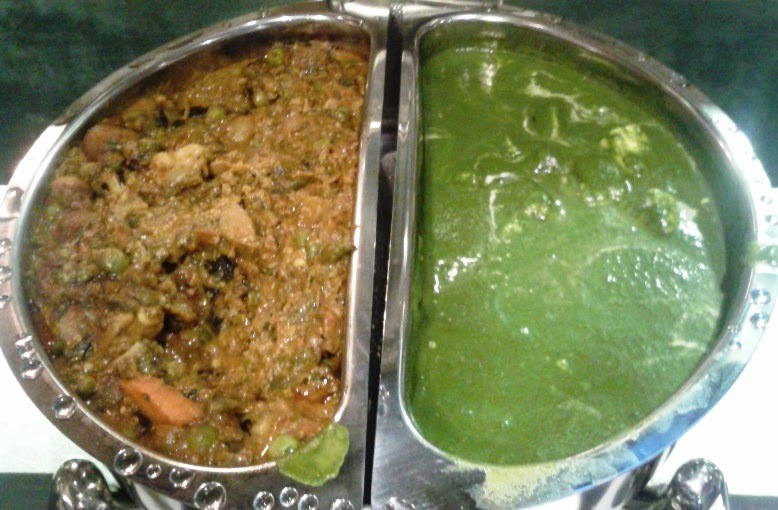 The international cuisine had been adjusted for Indian palates so it tasted all too familiar. Crew mate: Captain, can we use these money bags to buy us some stock and grog. Captain: Don't be thick lad. The only thing this money bag can buy is a full stomach. Crew mate: That be the best kind of money bags. The tomato soup was a tad bit thin. I just took a small portion for tasting and was not particularly interested in having more. They forgot to serve toasted bread pieces which are usually a must with tomato soup. 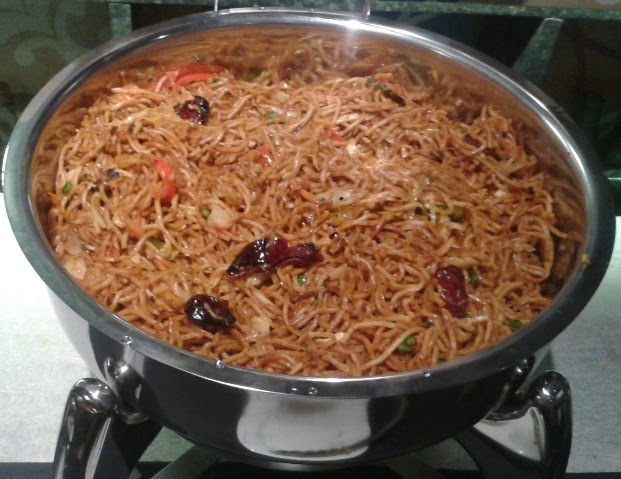 The highlight of the platter was definitely the basil noodles. 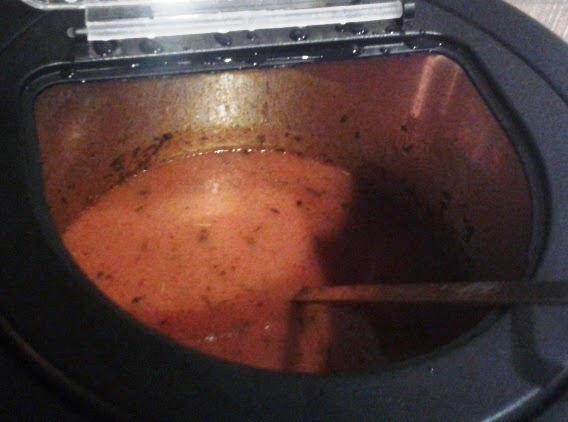 It tasted a bit tangy as if it had a hint of cilantro somewhere. It was definitely a new experience for me. And entirely a new creation on part of the chef. And this is something I would like to praise. When you create, you are always better than the times you imitate. I took seconds for this item. There was a small selection of salads as well. 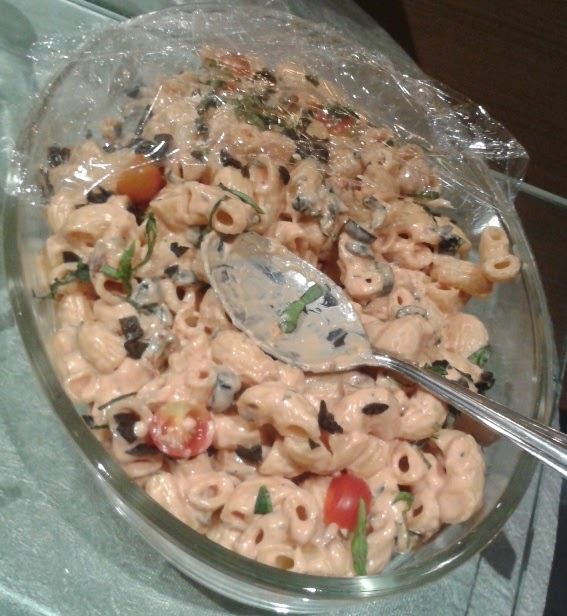 I suppose the stand out was the pasta salad which was sweet due to mayonnaise. The other salads did not look very appealing. 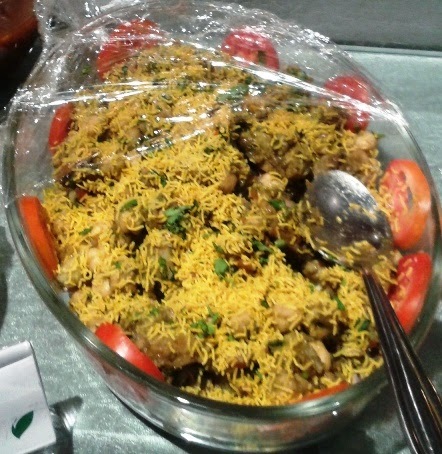 There was also Sev-Chaat in the salad area. No idea what it was doing there(Salads are healthy, Chaat is not) but it seemed be a popular choice for everyone at the table. Poppadums and bread were available as well. 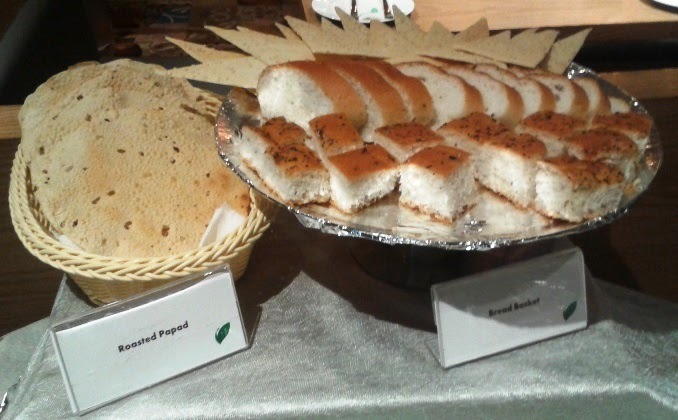 Although, there was no item on the platter that the bread really had a combination with hence I skipped it. The dessert platter was a wee bit of a disappointment. 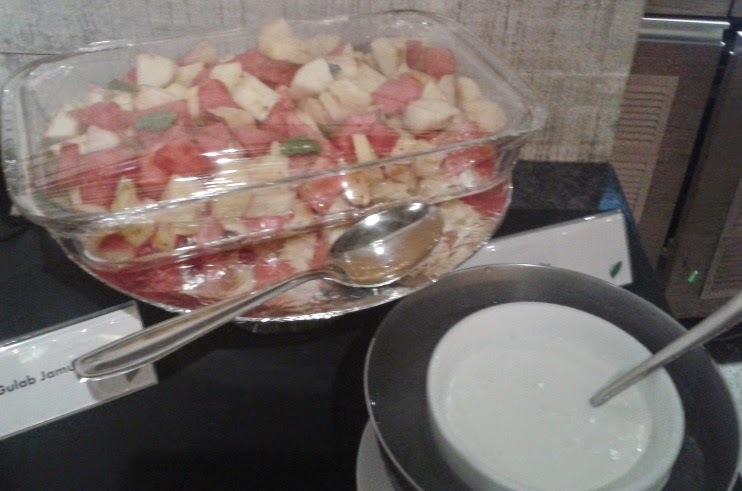 It was just Vanilla ice cream, Anguri(or grape sized) Gulab Jamun and Fruit salad. The ice cream was at the right temperature but it tasted very ordinary. I wrapped it with streams of chocolate sauce which was probably Hershey's syrup. 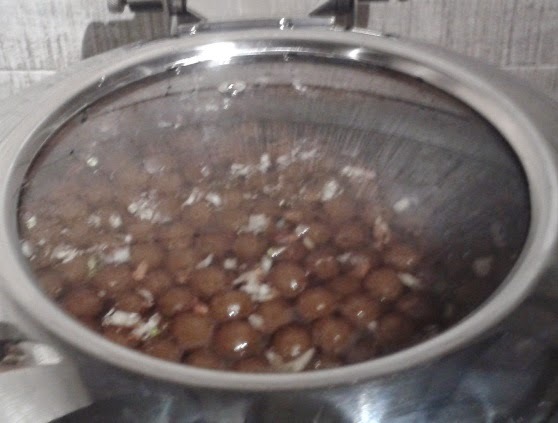 The Gulab Jamuns were tasty but again nothing out of the ordinary. 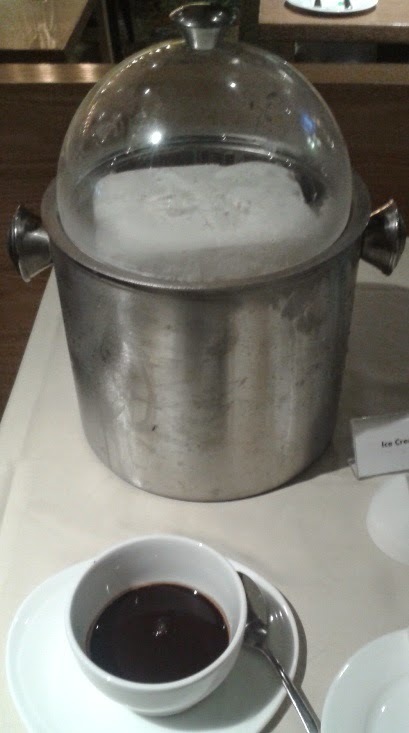 I often judge buffets by the desserts they serve. And well it was very limited in this case. 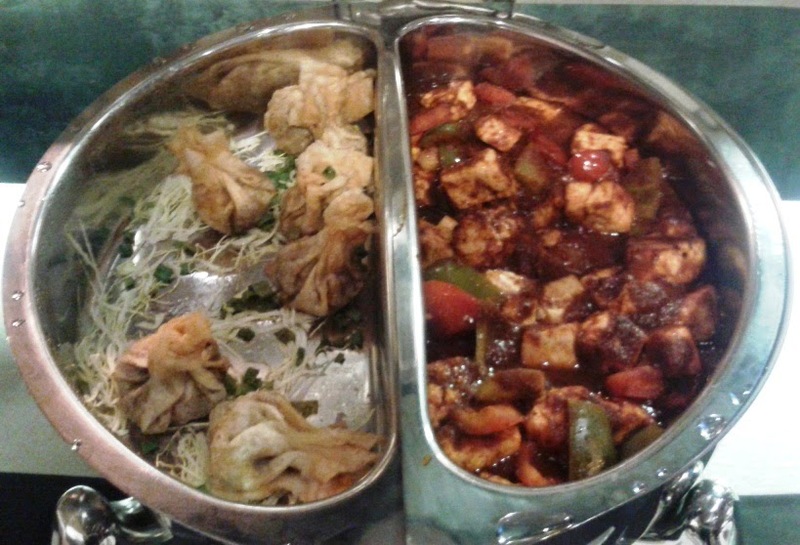 However, for a budget buffet for INR 299, it is an acceptable platter size. We were treated to this lovely fruit flavored drink after the meal. 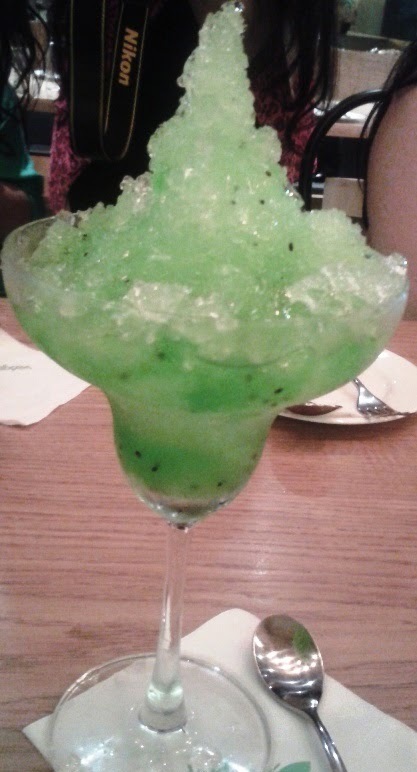 Made out of musk melon and mint (pudhina), it was one good gulp. Captain: Zip it lad. Not like we have rum all the time. Enjoy your drink or you will be sweeping decks for a year. As we approached Sayonnara time, the chef team presented us with a special that they had whipped up just for us. 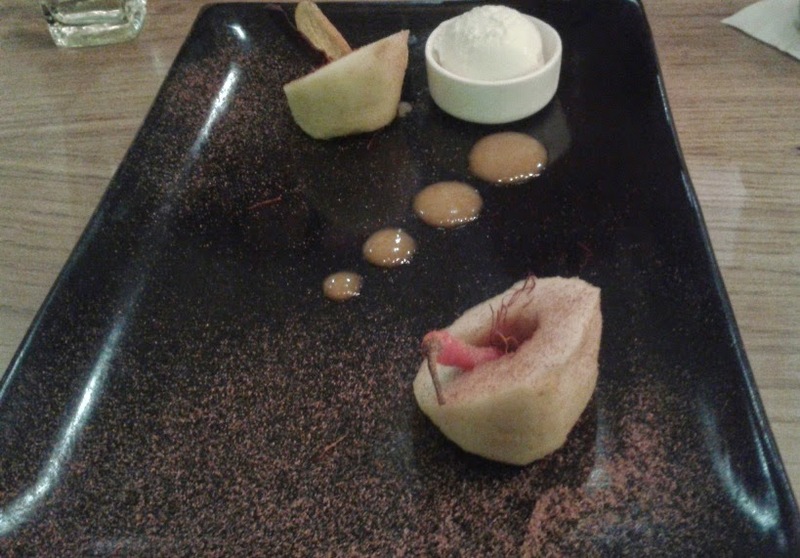 Made with cinnamon, spices and pieces of apple - it was a sumptuous gesture. It was presented well and made us feel all special. On our way out we were presented with Paan shots(betel leaf) as a mouth freshener. It contained mukhwas, mint, rose water and other ingredients as well. It was a good experience. The restaurant was neither the best nor perfect but it was a great experience. The ambiance definitely fits a fine dine. The management had energy and is willing to go up the steep slope of progress. In an area where you can find a dozen fine restaurants for every popular cuisine on the planet, this place has bravely opened up as a pure vegetarian place. 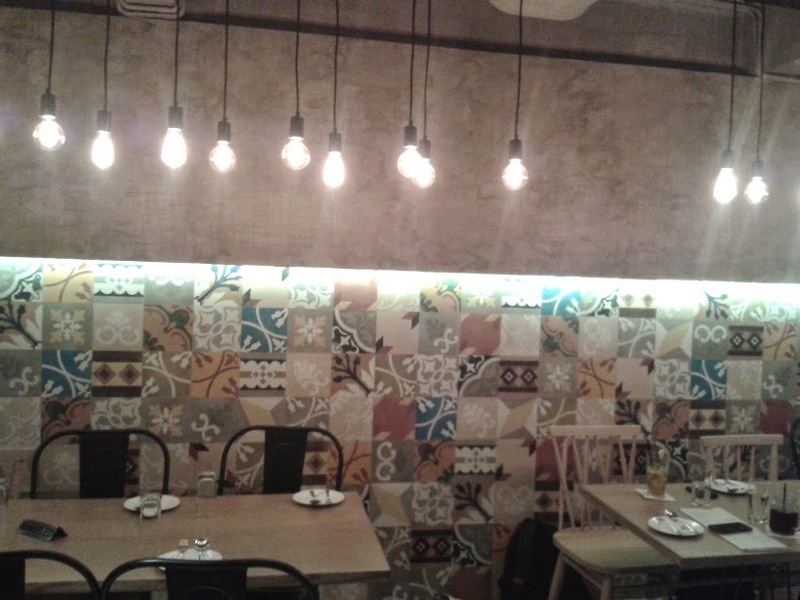 The food is far more decent than your average vegetarian fare found all across Mumbai. For INR 299, the buffet was certainly good. I would recommend this place for the strictly vegetarian types. "All hands on deck lads! Time to sail back to the high seas. Until next time."